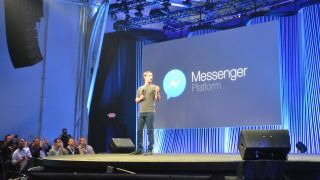 Facebook unveiled its vision for Messenger at its F8 developer conference today, and it's far more robust than its 600 million monthly users may have expected. Facebook Messenger will no longer be a means just for quick and silly chats: it's now an entire platform, one that has its sights set on rendering texts and emails obsolete. With the new Messenger Platform, developers can create apps specifically for Messenger that utilize GIFs, photos, videos, audio clips and whatever else they can cook up to make communicating more expressive and creative. Users will have more ways to interact using third-party apps, and developers will have greater exposure and engagement thanks to the Platform, Facebook said. When users receive a message from an app they don't have, clicking "Install" will take them directly to the app store to install the application. If users have the app but aren't using it in Messenger, hitting "Reply" will take them to the app to start using app-appropriate content. The revamped Messenger will have what is essentially a featured app tab that provides a shortcut for Messenger apps already installed and highlights applications users may be interested in checking out. Among the apps already made for Messenger Platform are Pic Stitch, Ditty and ESPN. The Messenger Platform SDK is open to developers now and 40 apps are ready for users to start using today. User-to-user conversations aren't the only thing seeing an update in Messenger. Businesses also now have the ability to communicate with customers directly, sending personalized and detailed messages with order confirmations, shipping status updates and more to their clients. Users will opt to have messages sent to them by businesses, so don't expect spam notifications to start appearing in your chat streams. Customers can reach out to businesses via Messenger, too, creating a two-way flow of free-form questions and answers. Facebook hopes Businesses on Messenger creates a personable shopping experience akin to the good ol' days when we'd pop into actual stores and talk to actual humans rather than tap on our screens to buy goods. To start, Facebook has partnered with Everlane and zulily and it's working with Zendesk to support live chats. Look for the business integrations to launch in the coming weeks.